Apply now with our Online Application Form. We work in and around the Chicago-land area. All applicants must be at least 18 years of age with proof of age required; Current Valid Photo ID and Social Security Card required. All applicants are subject to a criminal background check process, and pre-employment drug test. Email description of interest, qualifications and contact information. Our season runs from April through October, and this is a seasonal position. Include a copy of your Current Valid Photo ID which must show your current legal address. 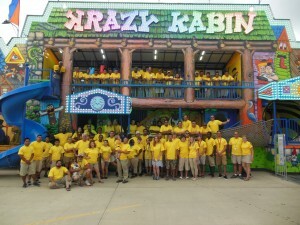 Fantasy Amusement Co. Inc. is a drug free company. All Employees are subject to pre-employment and random drug testing. Drug Testing is preformed by an outside company; and NOT done in house. We exercise a Zero Tolerance policy. All Employees are required to wear the company uniform which includes a Freshly Laundered Show shirt and Khaki pants. Pants must be worn around the waist and not be baggy, ripped or soiled. Cut-offs are not allowed, and khaki shorts (NOT cutoffs) are acceptable during warmer months. Closed toed shoes must be worn while working. No face jewelry/facial piercings (nose, lip, eye, or tongue rings or studs)permitted while working. Male staff are not permitted to wear ear rings/ear studs while working. Offensive or Excessive Tattoos are not acceptable and you maybe asked to keep covered. Our midways are Smoke Free at ALL times. All Staff is required to have a clean neat appearance and excellent personal hygiene. All male staff must have short well groomed hair and be clean shaven. We are proud to say we still have events that we have been working since our first year in business, and employees that have been with us since the beginning too. For 32 years, Fantasy Amusement Company, Inc. has worked to provide local Fairs, Festivals, Civic Groups, Special Events, Shopping centers and Churches with means for a successful fund-raising event. For several years, we have worked with various agencies to bring staff from other countries and overseas to work during the summer months. It has been a very successful program, and many staff return to work each year. We had 2nd generation family members join our staff last year, and they are planning to return this year.